Today, Saturday, is the sixty-eight anniversary of Deir Yassin massacre committed by the Ergun and Stern Zionist terrorist organizations against this village in 1948, killing 250-360 Palestinian in cold blood, after the two groups invaded the village of 750 inhabitants. By the time the villagers realized the intensity of the terrorist attack, hundreds were already dead, and the rest fled for their lives, before the terrorist groups occupied it. The attack and bloodshed started approximately at 3 at dawn, but the two Zionist groups were met with armed resistance that also led to the death of four attackers and the injury of 32 others. After that, terrorists of Ergun and Stern called for help from the “Hagana” leadership in Jerusalem, and once more armed terrorists arrived, many carrying automatic machine guns, they started firing on the villages, including women, elderly and children, and managed to retrieve their dead and wounded. The assailants also asked for reinforcement from the “Palmach” striking company under the Hagana leadership. The Palmach, stationed in a military base near Jerusalem, started shelling Deir Yassin with mortar shells, in order to facilitate the invasion by Stern and Ergun. By noon that day, all forms of resistance in Deir Yassin were eliminated, then Stern and Ergun terrorists started detonating the village’s homes, one by one, with dynamite. Many villagers were detained, forced against walls and executed on the spot, and the terrorists then loaded cars and trucks with Palestinians captured in the village, and paraded through the streets while chanting racist slogans. 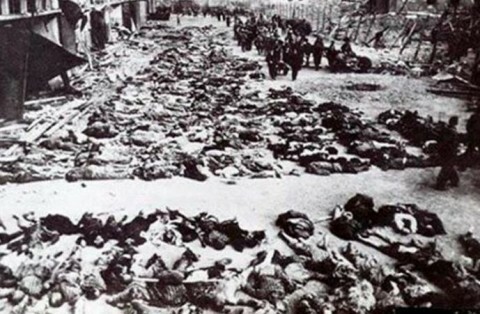 The massacre in Deir Yassin remains a historic mark in the Palestinian struggle that witnessed dozens of massacres, forcing hundreds of thousands of terrified Palestinians to fled Palestine into nearby Arab countries before the 1948 war that eventually led to occupying historic Palestine, and the establishment of Israel. The Nakba led to the displacement of 750,000 Palestinians in 1947-48, after hundreds of villages and towns were destroyed, and depopulated. Thanks for posting this report that has details previously unknown to me. I continue to have (time consuming) trouble linking to this valuable site…slightly better perhaps than it was a week or so ago. Cry for Deir Yassin! Viva Palestine!